Use this page to quickly find an East Texas Campground, State Park, RV park, or a Texas lake. East Texas is home to several excellent Texas States, several top rated RV parks, and some beautiful lakes. Click on the map icon to find out more about East Texas RV parks, State Parks, or Texas lakes. 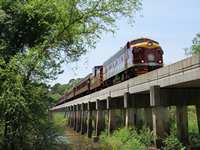 And East Texas to home to lots of fun things to see and do ranging from vintage train rides to golf courses to museums, zoos, great restaurants, and lot more. Red icons mean that we have visited the park or lake and written a review with pictures, ratings, and lots of detailed information about the park or lake. If we have reviewed a Texas campground, lake, RV Park, or Texas State Park, the reviews will have pictures and tell you something about the lake or campground, what to do, nearby activities, and much more. Reviewed lakes and campgrounds have a red map icon -- click on the red lake or red campground icon on the map and in the caption box you will find a variety of information some of which includes: a link to the web site, phone number, a campsite reservation link, the Texas Outside rating, and a link to the Texas Outside review.